The Thunderer front-paged the news that “Tony Blair is in line to be proclaimed Europe’s first president within weeks if the Irish vote “yes” in today’s referendum. Senior British sources have told The Times that President Sarkozy has decided that Mr Blair is the best candidate and that Angela Merkel has softened her opposition” written with authority by the paper’s chief political correspondent, Philip Webster. 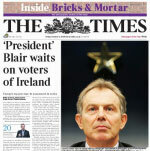 “Tony Blair’s star in the ascendant as presidency chances grow.” “EU prepares to welcome President Tony Blair” wrote David Charter in Brussels for The Times. Blair “is now a front-runner to become the second most powerful man on the planet after President Obama” claimed a breathless Andrew Pierce. “Number 10 believes that Angela Merkel, the German Chancellor, will add her support to the move if she is allowed to choose a German for the other new role created by the Lisbon Treaty, the high representative for foreign affairs” said Porter, also in the Telegraph. The idea that Tony Blair was the favourite for the job was taken as read by most of the serious broadsheet pundits from across the political spectrum (and James Macintyre). A form of parochialism that was much more than just a collective fantasia of social-democratic and europhile wishful thinking. How did the pundits get it so wrong?